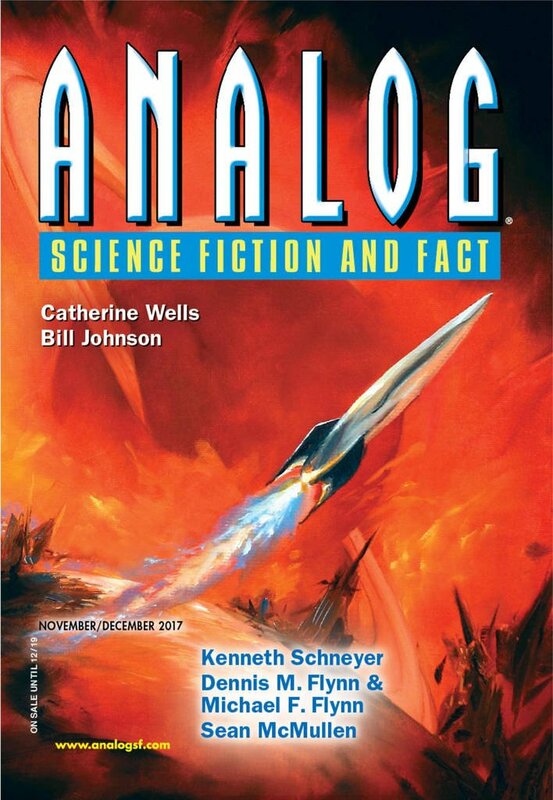 "Two Hours at Frontier," by Sean McMullen [bio] (edited by Trevor Quachri), appeared in Analog Science Fiction and Fact issue 11-12|17, published on October 19, 2017 by Penny Publications. Background: Back-of-the-envelope calculations suggest that planetoid has an eccentricity of about 0.75 and is about 0.8 light-days from Sol at perihelion, but they awaken near aphelion some 5.7 light days out, so the sun is about 50 times dimmer than they expect. Pro: The story is about how the crew make up their minds what they want to do in their new situation. Con: Wilson’s character breaks suspension of disbelief over and over.